Everywhere we turn there are reminders of the season -- spiders, monsters, goblins, and ghouls. But Halloween isn’t the only thing all around us. There are so many ways we can find math in our world, including the Halloween treats we enjoy! Just as parents foster an appreciation for reading with regular bedtime stories, you can also foster an appreciation for math with real world practice, like measuring ingredients in a cookie recipe! But don’t just make a plate of plain old cookies this Halloween season. Give them a bit of spooky oomph, and have fun with math while you’re at it; without the kids even knowing it! We scoured the internet and found a lot of great Halloween cookie recipes, from Good Housekeeping to Martha Stewart, but here’s our favorite recipe from Lil’ Luna! Mix in cake mix. Add green food coloring until it's the color you want. I used neon green. Chill for 30 minutes. Bake at 350 for 10-12 minutes. While warm push eyeballs into the center or all over the cookie. 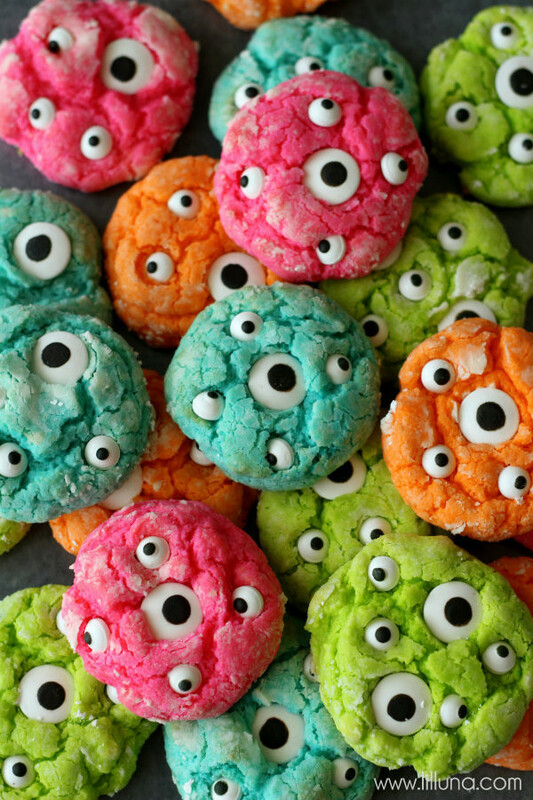 So whip up a batch of these creepy cookies and make sure to share your cooking adventures with us on social media! Will is great. And Jake is great. The staff are willing to go the extra mile to help the students achieve a better understanding of mathematics. I find that the mathnasium program is helping my daughter to better understand mathematics and we appreciate the flexibility of the program. We absolutely love Mathnasium of Vienna Va. Jake and his staff couldn't be more helpful and motivating to our daughter! More importantly, she loves it too! Our son has attended Mathnasium for several years to receive advanced mathematics instruction. We have been delighted with Mathnasium's structure, organization and staff. Very grateful for the sincere attention shown to my son from the staff at this particular location. The director is always cheerful and ready to help. He manages the center amazingly well and remembers intricate details of all the students and knows their strengths and weaknesses very well. Kudos! Not an easy task. We have had a positive experience so far at the Vienna Mathnasium center. Jake is very motivated and the tutors are knowledgeable. Jake, At Mathnasium Tysons, runs the establishment with such a welcoming spirit to not only newcomers, but established customers as well. He is always eager to help! The teachers at Mathnasium are equally helpful. They work hard to create an environment of encouragement, and positivity for math instruction. One of my children struggles with math, while the other excels. Both are eager to attend Mathnasium, and are excited when they grasp new concepts. Thank you Mathnasium, Tysons! This is some of the best money we have spent. My kids are building a solid math foundation while having fun. Thank you for all you do to make this such a great experience! appreciate the assessments that identify strengths, weaknesses and plan for future goals. We really enjoyed the summer session! Teachers were very nice and helpful. I would recommend having none weekend session available for four hours. It's tough to fit all sessions in and the weekend option would be great. I wish there were a few different membership tiers. That would allow "once a week" sessions (4 times at 1.5 hours each) for high-schoolers who are very busy to pay less than the $379 per month. My son likes being rewarded for completing his work. He likes the teachers and other students. My daughter who is 11years old likes going to Mathnasium in Tysons Corner because she likes everyone there. She says it is easy to work on math, do all she could in one hour and leave the center feeling good about what she learned. She is starting to feel like she can do math without dreading the time spent and enjoys seeing the familiar faces she got to learn over the summer. My daughters have always had a great experience at Mathnasium. My senior in high school is prepping for the SAT and Will has been especially helpful to her now and over the years. My son's experience with Mathnasium tutor was very happy, and He really enjoyed working with the tutor team. The staff Roy was friendly and supportive through all 10 months of my son studies. Dr.Bell, Roy, and the staff are fun, and helpful, and My Son hopes that he will meet them again next School year! We’ve been there for a few sessions and enjoy it. I wish there was a way to track my child’s progress instead of having to check with the director each time. We feel Tysons Mathnasium has been committed to helping our 16 year old son improve his math skills. He plans to continue over the summer in order to be better prepared for next year's Algebra 2. We appreciate the staff's work! Mathnasium was a key part of my son learning Algebra 1 at the a level they took the time with them and he's learned we really appreciate that as do working parents. This Mathnasium (Vienna) is the best math tutoring center in the area. The educators are amazing and care about the success of the kids! Dr. Bel runs a tight ship. We are so pleased with the wonderful work that Mathnasium does with our son. He is in Advanced Academics sixth grade. He recently took the IOWA Test and scored in the 99 percentile. My daughter is doing much better in math now. Thanks to Mathnasium! My son, who was never good at math, was able to pass high school math SOLs and received B and C in math classes. Without the great staff & the tough love of Dr. Bell, he would have never been able to make it through. If your child is struggling with math, I highly recommend the Mathnasium of Tysons. Thank you. My son learned a lot . Teachers are great and very helpful.I really recommend you to join this place. My daughter really enjoyed learning at this Mathnasium, she was very excited to come here every time. Mathnasium has enabled my son to survive a couple of years of bad math teachers. He has passed his math classes because of the help he receives here. My kids mathnasium. I have noticed that they are very confident in math. Mathnesium of Tysons was the best expérience for my son outside his High School. I definitely recommend it for every parent and every student. Mathnasium has enhanced my daughter's love of math! It has been a really nice experience to take my children to Mathnasium. They have been improving a lot at school and their grades have been showing it. My daughter loves mathnasium. The teachers are wonderful and very attentive towards the students. Because of Mathnasium she is also doing great in her school math studies. Well planned material and Teachers have more knowledge and more patience. My three daughters have been attending Mathnasium for five years. They love working with the knowledgeable and kind staff. Dr. Bell has always strived to accommodate our family schedule and the needs of my daughters. He knows the curriculum at the local schools so that the tutoring session is efficient. We hold Dr. Bell, Hind, and the staff in the highest regards. Thank you! All tutors are dedicated to providing best tutoring services. My kids are very excited and always looks forward to go to the Mathnasium. Thank you ! The tutors at Mathnasium have always been top-notch. They are willing to help the student understand material and are patient and encouraging. We always feel welcome at Mathnasium of Tysons. My daughter asks to come back! Kids don't mind going. Prize system is great idea. Our daughter has really enjoyed coming to Mathnasium. She comments on how nice the staff is when they are working with her. It is getting harder for her, but the staff is very helpful. Our daughter really likes to go there. She is very reward oriented. We are anxious to see how well she does in school this fall. Great experience at the lower levels, but had trouble sometimes with tutors at the higher math level. Isabel was incredibly nervous the first day I dropped her off at. When I picked her up she was smiling and excited about what she'd learned. What we want for her is practice, but most importantly confidence in the subject and so far she seems to be getting both. Thank you! Mathnesium of Tysons is a place where extremely dedicated educators do care about children learning, understanding and performing highly in Math. All students get personalized time and effort to make them succed. The flexibility is fantastic. We enjoy the staff. My children are developing their math skills with your program. Thank you! I'm very satisfied with the help we are getting at mathnasium, my son's grade has gone up from c to A- ever since we joined mathnasium. It's been so helpful for my son, not only with his math skills, but also with his confidence. Mathnasium is great both for kids who need help to catch up with their grade level and for kids who want to get ahead of their grade level. My kids proudly report when they complete a section in their binder. Kyra loves mathnasium and is much more confident in her abilities. My son really enjoys going! I like that my high school daughter gets help with her homework and has it checked by the tutors there - it's really been helping her with time management and with understanding the concepts. We've just joined but so far so good; math is so critical and we're glad our son can get some great help and individual attention. Thanks! The student to tutor ratio is great to give individual help to the students during sessions. At Mathnasium, the tutors are able to find exactly where the student is having trouble , and they rectify the situation. I can't say enough how much the wonderful instructors have helped my daughter in math. The tutors are extremely good and you can tell that they truly care about the students. I would highly recommend this particular site if your child struggles in math . I really appreciate the effort that was put in for my daughter Her scores has improved greatly. We love the flexibility (number of times per week we can bring our child) but most of all love the results! Mathnasium instructors usually go the extra mile to help students, taking the time to ensure that students not only calculate the right answer but understand it, too. Kyra really loves coming to Mathnasium and never wants to miss a day - even in a blizzard. She's feeling more confident with math and is enjoying both the review and help with getting basic concepts spot on so she can progress faster. And it's a huge blessing for her to have another source of help with homework as well. The only downside has been that the tutors don't always agree with one another as to whether she is doing her work correctly and if the answers to problems are correct. Hoping that there will be more consistency. My daughter has fun learning at Mathnasium. She is always excited to attend. We just started, so still assessing progress. But my kids seem to love it. We have been delighted with Mathnasium. The program is everything we hoped for and more. The administrative and teaching staff have been flexible in meeting our son's needs. He thoroughly enjoys his sessions and looks forward to going. This is a fantastic educational resource that we recommend for any student. Liam seems to enjoy going there (which I find surprising) and it definitely seems to be helping him out with his Algebra. The teachers are very patient and knowledgeable. The location is convenient and I like that the school is open in the evenings and on Saturdays. I love the flexibility of coming in whenever it works and that it doesn't have to be a consistent time each week. I'm seeing huge improvement in their understanding and in their grades. There is some variance in the instructors and their approach with working with the children which is to be expected. My suggestion would be to remind them to never make the kids feel "bad" about what they don't know. Also, would be great to have a feedback mechanism to the parents on their progress or areas where they need additional help. Mathnasium has been a lifesaver for us this year. It's a great approach to tutoring. Love it. I like having many tutors available at Mathnasium and ability to come to the center on any days (outside of my son's assigned tutoring days) if he needs help. I also like the flexible hours where I won't be penalized if I arrive at the center late. The director is very helpful, experienced and staff is very friendly. My daughter loves the sessions, and enjoys math much more at school as well now. Thanks for helping to build up her confidence. My daughters love Mathnasium. They look forward to going there because Dr Bell and the staff are very helpful and friendly. My kids have been there since they were in elementary school and now they are in HS, one is graduating this Summer. She said she will definitely miss Mathnasium when she goes off to college. Dr. Bell is an excellent educator. The material and instructors Mathnasium use is of high standards. My son had personally benefitted more from taking Mathnasium classes. My daughter, Cristina, enjoys her work at Mathnasium and says it's really helping her. I would know more about it after her next progress report or exam results, but as for me, I really appreciate how the staff are very nice and the program is flexible. Thanks.